Visions in Poetry is an innovative and award-winning series of classic poems reinterpreted for today's readers by outstanding contemporary artists in distinctively beautiful editions. 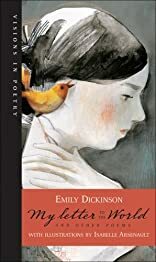 This is My Letter to the World and Other Poems by Emily Dickinson is brilliantly illustrated by Isabelle Arsenault. The artist's interpretation displays a rich understanding of Dickinson's poetry, which is known for its economy, unexpected imagery and hauntingly personal point of view.Arsenault has created a subtle meditation on Dickinson's life and its intersection with her verse. In the dream-like illustrations, the poet - sometimes serene, often sad and always enigmatic - is an omnipresent figure in her ghostly white dress. Dickinson's 'letters,' the words she left to the world, have found their ideal visual complement.